With the advent of pellet therapy, bio-identical hormone replacement is now more convenient and effective than ever. I am pleased to offer this state-of-the-art treatment to my patients with SottoPelle, a brand known for its ease of use, safety, and high success rate. What are the benefits of SottoPelle pellet therapy? Many patients describe the results of bio-identical hormone pellet therapy as life-changing. Women using bio-identical hormone pellet therapy can find freedom from the difficult symptoms of menopause and perimenopause. Hot flashes, mood swings, low libido, fatigue, “brain fog,” and even age-related weight gain can disappear with pellet therapy. My female patients are excited to note their restored energy level and libido, decreased body fat, and lighter mood. Hormone-related headaches often go away, osteoporosis can ease, and even depression and anxiety can find relief. The overall feeing is a sense of well-being. Can men benefit from SottoPelle pellet therapy? Just like women, men need hormones to feel their best. The effects of andropause (the male equivalent of menopause) can be just as devastating. When hormone levels dip, men can experience low libido, loss of muscle mass and strength, weight gain, moodiness, and other ill effects. When testosterone levels are restored with bio-identical hormone pellet therapy, these symptoms resolve. My male patients feel fantastic again—with a youthful libido, better mood, great energy and stamina, increased mental focus, and many other life-enhancing improvements. 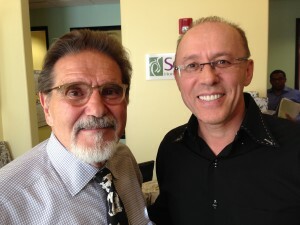 Dr. Ostrovsky with Dr. Tutera, founder of SottoPelle Therapy. SottoPelle Bio-identical hormone pellet therapy was invented by Dr. Gino Tutera. SottoPelle therapy involves the insertion of natural, plant-derived hormone pellets (testosterone and estradiol) under the skin. Insertion is painless, as a tiny pellet is slipped under the skin, typically in the hip. I use a mild, local anesthetic for the procedure, which takes only about five minutes. After the pellet is inserted, it releases a steady, low dose of natural hormones into the blood stream whenever the body needs it. The dosage is custom-formulated to fit your own body chemistry. SottoPelle hormone pellet therapy is superior for a variety of reasons. First, the hormones are bio-identical—so your body recognizes them just as it would recognize its own naturally produced hormones. Derived from plants, they are safe and natural. They are also hassle-free, requiring insertion only once every 3–9 months. One of the most unique aspects of the pellets is that they secrete hormones into the blood, just like an endocrine gland. This is the way hormones are meant to be—and the way your body responds to them best. Bio-identical hormone pellet therapy with SottoPelle is better than topical creams and oral pills. If you use hormone creams, you will experience peaks and troughs in your hormone levels throughout the day. You’ll also have the danger of cross-contamination. Estrogens may be transferred accidentally to your spouse and children via the skin. Hormones taken orally have the same peaks and troughs, as well as unpredictable absorption, and the danger of metabolizing to carcinogenic metabolites. Bio-identical hormone pellet therapy has none of these risks—so it’s truly worry-free. Once they are inserted under the skin, the pellets release hormones into the blood. Your own body can control this release of hormones, just as it did when your ovaries or testicles were at peak youthful production. The amount of hormones released will vary according to the demands of the body with exercise, for example. In this sense, the pellets mimic the effects of the gonads, matching hormone levels to the body’s physiological needs. You might have heard the common myth that bio-identical hormone therapy has not been proven safe. Nothing could be further from the truth! Contrary to popular belief, bio-identical hormone replacement therapy has been around for decades. In fact it has been scientifically studied and tested—and has been used safely and effectively—since the 1930s. Pellet therapy similar to SottoPelle has been researched and documented in medical journals since 1939. SottoPelle is based on science and a full understanding of human biochemistry. The pellets are compounded according to the highest industry standards, using the best plant-based ingredients available. Talk to me about how you can get started with bio-identical hormone pellet therapy. Get ready to change your life, and your health, for the better!